The Roman Forum was for centuries the center of Rome’s public life. All important social and political events took place here, from elections to public speeches, from triumphal processions to criminal trials, from gladiatorial matches to commercial affairs. Known by the citizens of the time as the Forum Magnum, or simply the Forum (meaning piazza, square), it remained the heart of Rome from the 8th century BC to the 7th century AD. A walk along the Roman Forum is a must for anybody visiting Rome. However, because information panels are practically non-existent, looking at the ruins of the buildings without knowing why they were built and what went on inside may take away from the experience. That’s why I’d recommend to tour the Forum in the company of a local guide. 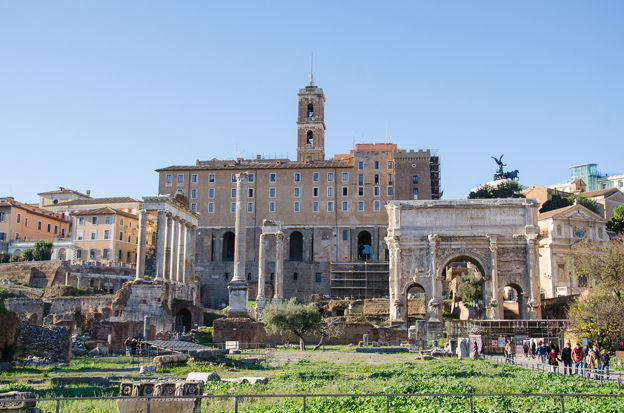 The Forum is framed by the Capitoline Hill on one side and the Palatine Hill on the other. Here are some of the highlights from my visit, beginning at the Capitoline Hill at the north-west end of the Forum. You will be walking along the Via Sacra, ancient Rome’s main street, leading from the Capitoline Hill to the Colosseum passing some of the Forum’s most important buildings. The road was part of the traditional route of the Roman Triumps, which celebrated the success of military commanders. On the front slope of the Capitoline Hill is the Tabularium, the repository for official state archives. The large building, which also housed the offices of many city officials, dates to 78 BC. From the 67-meter-long corridor, which is still partly preserved, the arched windows look out over the Forum. The tower was added in the 1300s, while the upper and western parts were demolished by Michelangelo to work on the design of the Palazzo Senatorio, built atop the Tabularium in the 12th century. Close to the foot of the Capitoline Hill is the Triumphal Arch of Septimius Severus, built in 203 AD to commemorate the victories of emperor Septimius Severus and his two sons, Caracalla and Geta, in the wars against the Parthians. Built in brick and travertine, clad with marble slabs, it is a three-way triumphal arch, measuring almost 21 meters in height and 23 meters in width. Triumphal arches were introduced by the Romans to celebrate the military victories of emperors, who would pass below the main arch. To the left of the arch is the Curia Julia, the official meeting place of the Roman Senate. After voting, senators would come out of the building and share their decisions with citizens gathered in the Forum. Construction began in 44 BC under Julius Caesar, but was interrupted following Caesar’s assassination. It was finished by his successor, Augustus, in 29 BC. The Curia Julia has been well preserved thanks to its conversion into the basilica of Sant’Adriano al Foro in the 7th century. Many of the temples built in the Roman Forum during the Imperial era (27 B.C. – A.D. 476) were erected to commemorate emperors of Rome who had been particularly influential and popular, and who were deified after death. The temple that began this tradition is the Temple of Caesar, built in honor of Julius Caesar by his adopted son Augustus on the site where the assassinated Caesar had been cremated. 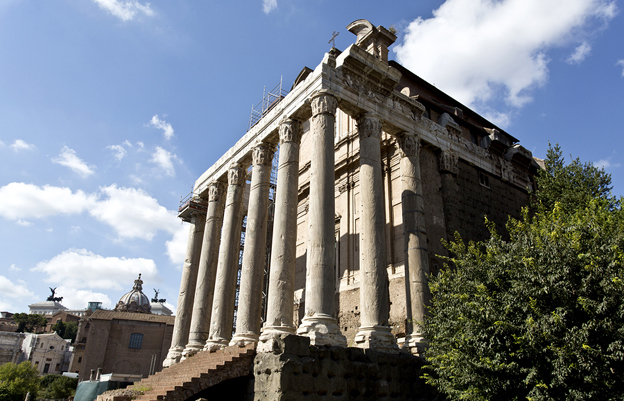 Two more temples in the Forum which are well preserved are the Temple of Antoninus and Faustina and the Temple of Romulus. The first was built by emperor Antoninus Pius in 141 A.D. to honor his deceased wife, Faustina. It was rededicated when he was deified after his death in A.D. 161. It was later converted into the Church of San Lorenzo in Miranda, which incorporated the remains of the original temple. The circular Temple of Romulus was dedicated to Romulus by his father Maxentius, who deified him, in A.D. 307. Today, part of the temple lies within the basilica of Santi Cosma e Damiano. The 4th-century AD green door is still functioning with the original mechanism. 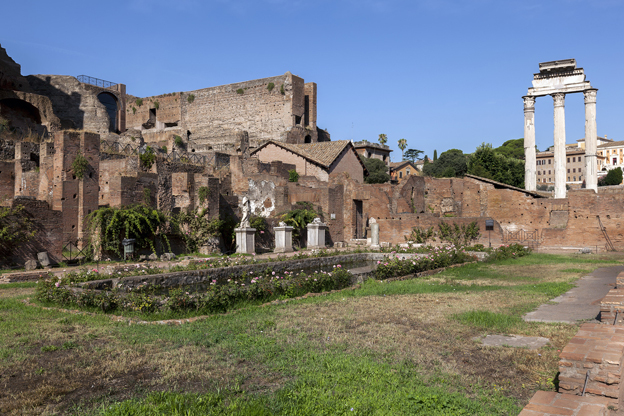 The Forum’s most famous and beautiful building, a three-story 50-room palace built around an elegant elongated atrium with a double pool, was the House of the Vestal Virgins. It was the residence of the “Vestali”, a group of six high priestesses, responsible for keeping the sacred fire of Vesta, goddess of fire, alive. As long as her flame was kept burning, it was believed, the Roman civilization would continue. The Vestal Virgins were chosen by the Pontifex Maximus, the chief priest of Rome (who coincided with the emperor starting with Augustus). They had to be of noble Roman birth, between the ages of six and ten, beautiful, and agree to remain virgins for the duration of their time as Vestals – at least 30 years. If they broke the rule, they would be burned alive. Nobody was allowed to enter the House, but you can today. Reaching the other end of the Forum, toward the Colosseum, is the largest structure still standing, the Basilica of Maxentius. A triumph of Roman engineering, the Basilica covered an area of 6,500 square meters. It was divided into a central nave, two lateral aisles, and an atrium. The central vaults were up to 35 meters high, while the Corinthian columns reached a height of 14.5 meters. The floors were covered in marble and geometric patterns, similar to the Pantheon. Construction started in 308 AD by the emperor Maxentius and was later finished by Constantine after he defeated Maxentius in the Battle of the Milvian Bridge in 312 AD. When Constantine legalized the Christian religion, he decided to use the Roman basilica as the model for Christian churches. End your visit 40 meters above the Forum on the Palatine Hill, ancient Rome’s most exclusive neighborhood, the site of the emperors’ opulent palaces. Most of the Palatino is covered today by the ruins of Emperor Domitian's complex, which served as the main imperial palace for 300 years. It is the best way to end your tour because of the memorable views over the Forum (especially from the viewing balcony of the Orti Farnesiani). If you're interested in booking a guided tour of the Roman Forum, check out the local tour company The Roman Guy.